Kelley Deal has every right to take on the role of a too-cool-for-this rock star in interviews. After all, she and her identical twin sister—lead vocalist/rhythm guitarist and former Pixies bassist Kim Deal—head influential '90s alt-rock band The Breeders, tourmates of Nirvana and creators of the legendary 1993 platinum album Last Splash. But instead, she begins this interview by commenting on the current dismal weather in her hometown of Dayton, Ohio, saying that the pouring rain makes her "want to go back to bed." She's similarly down to earth when discussing The Breeders' humble beginnings, as well as the band's current state of being. In 2013, the Last Splash-era lineup of the Deal sisters, bassist Josephine Wiggs and drummer Jim MacPherson came together after an almost 20-year hiatus to embark on a tour in celebration of the 20th anniversary of Last Splash, but the reformation birthed more than nostalgia. 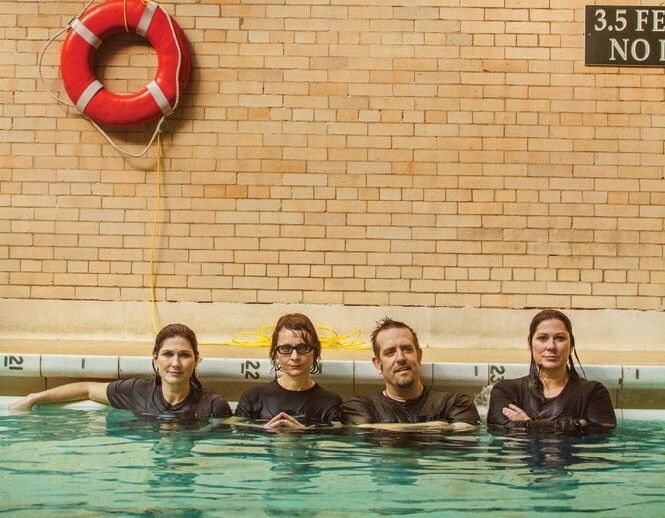 The Breeders are now "testing the waters," Kelley says, with being a full-fledged band again, writing their first new material since 1993 and playing those songs on a tour that will conclude at a show with Neutral Milk Hotel in Los Angeles. But before The Breeders were catapulted into international stardom, the band was an occasional duo made up of the teenage Kelley and Kim, who were writing music that they'd perform at truck stops and in bars they were too young to be in. Isolated in their small Midwestern hometown, unable to draw inspiration from larger acts, "we didn't have this vision of anything because we were so naive," Kelley says. "We didn't even know what to do next or anything, so we just played together." Kim reused the name when she started The Breeders officially in 1989, but the band went on hiatus in 1994 when lead guitarist Kelley entered rehab for heroin addiction. The Breeders would continue to release music and play shows with various lineups, but the strange magic of Last Splash—with its meandering bass lines, walls of noisy guitar and bewitching vocals from Kim and Kelley—is what continued to define the band. Before the Deals got back together with Wiggs and MacPherson to play the songs from Last Splash—including mega-hit single "Cannonball"—Kelley says she wondered if it would work, of if The Breeders could only exist in the '90s, asking herself, "What about working with those people was so special? What if we tried that again, would it still be special, or was it just the time?" But the chemistry was instantaneous, like talking to an old friend, Kelley says. "You can go right back to that time and feel like nothing's changed, like you absolutely just picked up the conversation exactly where you left off. Now on one hand, that's a really wonderful thing, [but] it does make you think, 'Oh my god, have I not changed? Has nobody changed? What have we learned in 20 years?'" After giving Last Splash its day, Kelley and the rest of the band are back at the "really interesting work" of writing new music, a process she approaches with utmost attention to detail. "It's one to thing to say, 'I'm an architect, I like to design buildings,' and you sit there and you draw a picture of a building," she says. "That's not what designing a building is about. It's about getting in there and finding your stress test and whatever materials and engineering and stuff." Finding how the music's components should all fit together, she says, is "engineering a song, in a way." There's no release date for an album yet, but one thing that's certain is Kelley and Kim are still as devoted as ever to making penetrating, visceral rock. "At the end of what we're doing," she says, "whatever emotion, it doesn't even really matter what the emotion is, as long as there is one at the end of it."